How to Become a THiNKaha Author | THiNKaha: Become a recognized expert in your field of expertise. Compelling thought leadership content. 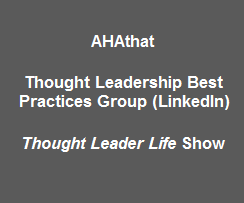 The THiNKaha series is a comprised of physical (THiNKaha Elite) and AHAthat books that contain 140 well-thought out quotes (“AHAs”) that are 140 characters or less. These books are quick to read and very memorable. 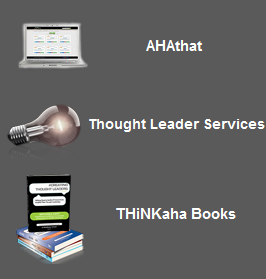 THiNKaha Elite books are delivered in paperback, eBook (PDF, Amazon Kindle, Sony Reader, B&N Nook, etc.) and via the AHAthat available at http://www.ahathat.com/. AHAthat books are much easier to create as they don’t have back covers, forewords, endorsements, dedications, acknowledgements, or section introductions; they are only comprised of 140 AHAs and a front cover. Or please feel free to share your ideas: https://www.thinkaha.com/contribute. HOW DO I GET STARTED? Fill out the answers to the four or six questions which will help you clarify your thinking process. You can pick them up in Word or PDF format above. WHAT IF I’M NOT SATISFIED WITH THE FINISHED PRODUCT? Not possible! You will see the book creation all along the way and can stop anytime prior to publishing. If you don’t like what you/we published after it’s been published, please let us know and we’ll figure out how to fix it. WHAT IF I PAY FOR A GHOSTWRITER AND I’M NOT SATISFIED WITH THE FINISHED PRODUCT? If you don’t like the ghostwriter, we’ll pick another that you will like. You’re actively involved with the book writing process the entire time. We ask for your review and input in the writing process, cover and jacket creation, copy edit, and content layout. There will be no surprises! With this process, we are striving for and typically achieving 100% satisfaction. HOW MUCH TIME DO I PERSONALLY HAVE TO PUT IN WHEN GETTING MY BOOK GHOSTWRITTEN? If we’re condensing an existing book, you may spend as little as an hour. If we’re creating the content from discussions with you, your blog, articles, etc., it may take 5-15 hours. WHAT PERCENTAGE OF SALES WILL I RECEIVE? Depends on the type of book. For books submitted in the THiNKaha Elite series, we pay the author 25% of gross profit on sales of the book (including author purchases). For books submitted in the AHAthat series, we pay the author 51% of gross profit on sales of the book or the email addresses of those that downloaded it. WILL MY BOOK APPEAR IN LOCAL BOOKSTORES AND LIBRARIES? Typically not. The cost and time necessary to get your books locally does not pay for itself. The question we like to ask is “How many prospects are going to walk into a local bookstore and see your book?” It’s much better that you spend your resources and energy putting the books in the hands of your prospects. WILL MY BOOK APPEAR IN AMAZON AND BE IN THE LIBRARY OF CONGRESS? Yes, our THiNKaha Elite books are all in the Library of Congress, plus Amazon US, Canada, U.K., Germany, France, and Japan. We also list your book in other physical and eBook programs that drive awareness including Ingram, Baker & Taylor, Amazon Inside, Amazon Kindle, OverDrive, and NetLibrary. Books in the AHAthat series are only in the app.